If your cat is an indoor cat or doesn’t spend a lot of time running around outside, then you may be concerned about them getting enough exercise to avoid becoming overweight. While it’s true that cats have a high metabolism that works even when they are sitting around, it is still important for them to get exercise and besides, it’s fun! 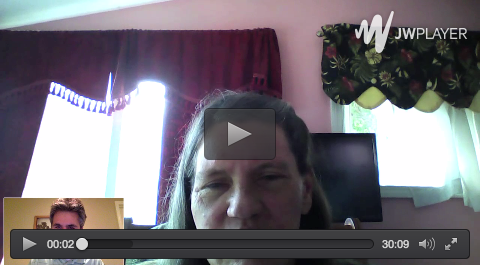 There are actually lots of different ways for an indoor cat to get exercise. Of course, if you start from when they are a kitten, you can train them to go for a walk on a leash like a dog but this can lead to some odd looks and, more importantly, some confrontations as cats can be a bit argumentative. Dogs may have a bark or a sniff at another dog whereas cats are more likely to go at it as much as look at each other. So one of the best solutions to getting your cat the exercise he or she needs to keep fit and health is to invest in one of the top cat perches. While many of these may look like somewhere else comfortable for them to sit, if you pick the right ones, even getting to their sitting place can get a bit of exercise involved. One of the first things to think of when selecting a cat perch is how much room you have to accommodate it. 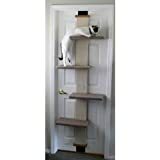 If you have a good sized corner to situate it where the cat can play to its heart’s content without blocking up the room, then consider the Go Pet Club Cat Tree. This is a good sized perch covered in beige material that stands 72inches high, 50 inches wide and 26 inches in length. Beneath the fake faux is wood and the posts are covered by natural sisal rope which is a great scratching post material. The perch is easy to assemble and features ten different posts with 15 levels across it. If space is more an issue, then consider an option such as the SmartCat Multi-Level Cat Climber. 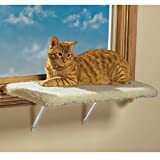 This is a really clever cat perch that attaches to the back of a door but can be easily moved from one room to another. It will fit any door between 79 – 82 inches in height and is easy to assemble. It is perfect for scratching, climbing and exercising as well as sleeping on the various levels and has natural sisal between the platforms for scratching. If you have a small amount of space to dedicate to the cat perch, then one options is something along the lines of the Majestic Pet-Majestic Bungalow Cat Tree. 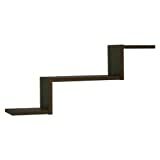 This is the smallest in a large range of perches produced by this manufacturer and measures just 27inches high, 20inches long and 20 inches wide. It still features two flat platforms and a nesting cup for them to sleep on as well as sisal rope across the posts for scratching. It is simple to assemble and comes with the tools needed to finish the job. Experts recommend that an indoor cat gets at least 10-15 minutes exercise each day to avoid problems such as obesity and it is a good way to play with your cat using a perch and some other toys. This is usually longer for younger cats who have more energy and a little less for older cats, especially if they have joint problems or may benefit better from little, short play stints. Plus it is a great way to bond with your cat by doing something together that you will both enjoy!